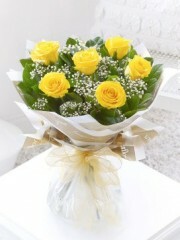 We love the way these sunshine yellow roses really light up this beautiful bouquet. We’ve added an array of crisp white flowers including stunning lilies and pretty germini and interspersed them with delicate white gypsophila. 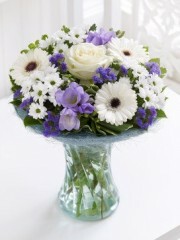 This vase full of pretty white and purple flowers really is the perfect gift. It's ready to display, easy to look after and it's filled with a selection of favourites.Featuring a white large-headed rose, white germinis, purple lisianthus, and white spray chrysanthemums with statice and salal, presented in a curved glass vase with powder blue sisal collar. Surprise and delight them with this colourful gift bag full of flowers. With vibrant shades of burnt orange, hot pink, sunshine yellow and deep purple, this selection is a celebration of colour and a real feast for the eyes. This charming jute bag filled with pretty pink flowers makes a very feminine gift for someone special. The soft shades of pastel pink with fresh white look wonderful together. This is a lovely treat they’ll be delighted to receive. 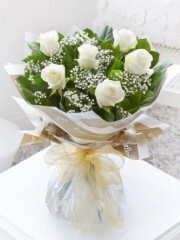 This chic, classic half dozen showcases the very finest large headed white roses beautifully. The roses and gypsophila complement each other perfectly, and the elegant wrap and ribbon add a sophisticated finishing touch. Why not send the gift of roses with an enchanting twist? 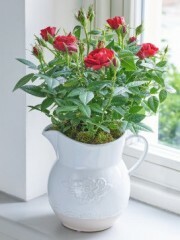 Here we’ve chosen a flowering rose in flame red and planted it in a cute ceramic jug. The result is a country kitchen style display that will look delightful in any home and can be enjoyed for weeks to come. 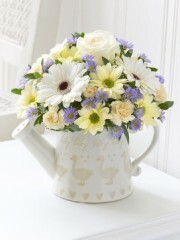 Pretty as a picture, our decorative watering can display is brimming with fresh flowers and has a cute baby duckling motif. 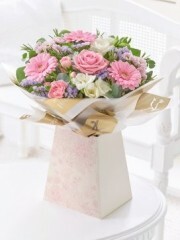 We’ve chosen flowers in soft shades of pink accented with cream to celebrate the arrival of a beautiful new baby girl. Full of textures and variety, this gift is a miniature garden perfect for enjoying inside. We’ve chosen a pink rose plant, a pink flowering kalanchoe as well as ivy and palm. The result is a pretty display of colour and greenery that they are sure to admire. 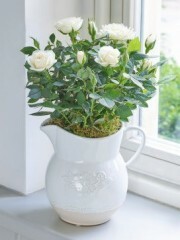 This pretty flowering rose plant in creamy white looks fabulous planted in a countryside kitchen style ceramic jug. 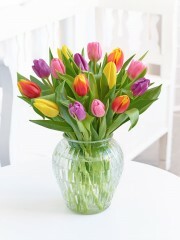 It’s a thoughtful gift that can be displayed instantly on a sunny window ledge or table and enjoyed for weeks to come. The jug is a delightful keepsake too. 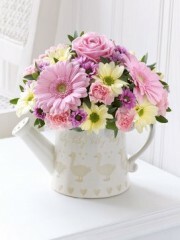 For something a little different, send your best wishes with this charming arrangement. 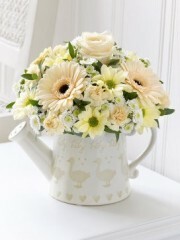 The decorative watering can has a sweet baby duckling design and looks stunning filled with fresh flowers in shades of cream, white and peach. Adorable – just like their new arrival! Combining traditional lilies with pretty germini and a stunning large-headed rose, this hand-tied bouquet gives a welcome touch of warmth and softness. It will make a thoughtful gift. 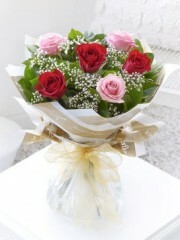 This chic, classic half dozen showcases the very finest large headed red and pink roses beautifully. The roses and gypsophila complement each other perfectly, and the elegant wrap and ribbon add a sophisticated finishing touch. 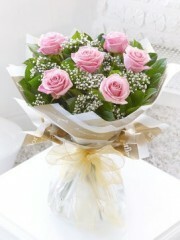 This chic, classic hand-tied showcases the very finest large headed pink roses beautifully. The roses and gypsophila complement each other perfectly, and the elegant wrap and ribbon add a sophisticated finishing touch. 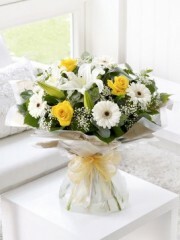 This chic, classic bouquet showcases the very finest large headed yellow roses beautifully. The roses and foliage compliment each other perfectly, and the elegant wrap and ribbon add a sophisticated finishing touch. 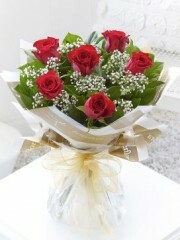 This chic, classic hand-tied showcases the very finest large headed red roses beautifully. The roses and foliage compliment each other perfectly, and the elegant wrap and ribbon add a sophisticated finishing touch. When it comes to flowers, summer is perhaps the most colourful of the seasons. 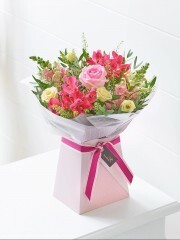 We’ve captured the warmth of summer sunshine with this beautiful bouquet in vibrant tones. A lovely gift for someone special. Stonehaven flowers have a selection of flowers and gifts that come under £30 and that’s often with the vase or an attractive container included. At our Stonehaven Florist we try and offer you value for money as well at top quality flowers, that are as fresh as you can get. Directly imported from Holland up to 4 times week, our flowers at Stonehaven florist are always fresh and we have a good variety. If you are on a budget, or just looking for something small its not a problem because we have many bouquets under £30 and we promise not to compromise on quality or style and to offer you gorgeous flowers that can be delivered, all organised simply and easily online. Should you have any queries regarding any of our products feel free to give s a call or email us and one of our team of florist will happily help you. Fresh flowers at a good price, with top quality service is what we strive to offer our customers, At Stonehaven flowers we can deliver the same day, next day or even any day of your choice if you are planning ahead. So whether it’s a birthday gift, a thank you or any other occasion we certainly have something suitable for you. Copyright Used with permission of Interflora British Unit. 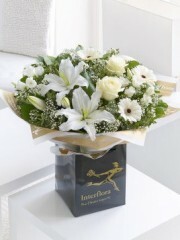 Four Seasons Florist Ltd trading as Stonehaven Flowers. © 2017 Stonehaven Flowers, All Rights Reserved.